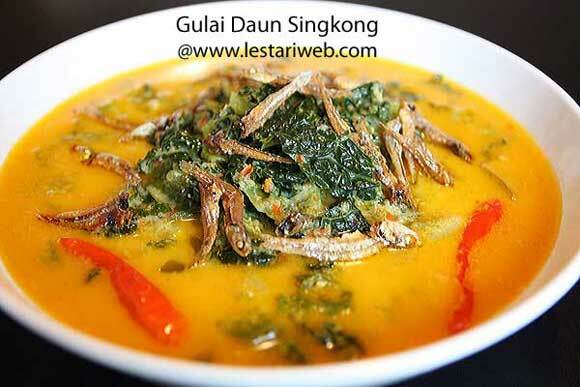 In his hometown in West Sumatra , this curry is usually made with fiddlehead, so they call it " Gulai Daun Paku ". While in Padang restaurants, I often see them made with long beans and cabbage. 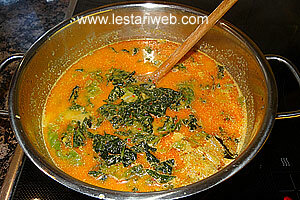 Cassava leaf is indeed my favorite, unfortunately this one is not available here in the west . 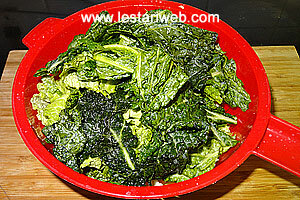 As an alternative I replace it with curly kale (German = Gruenkohl ). 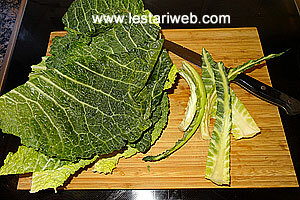 As curly kale is not always obtainable then I made an experiment with savoy ( German = Wirsing). At first I was skeptical with it's hard texture . But after I tried some tricks here & there, I am quite surprised & satisfied with the result. This curry dish tastes really superb, I think what a pity when I skip it from the menu-list just because of one distinctive leaf requirement. 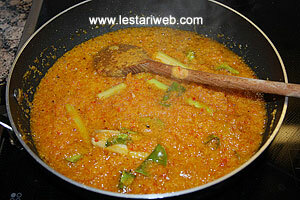 Indeed, this curry always tastes delicious, it doesn't matter what kind of vegetables you use!!. 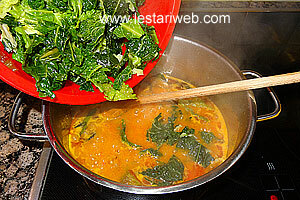 If you replace cassava leaf with savoy or curly kale, discard the hard part/rib of the leaves. 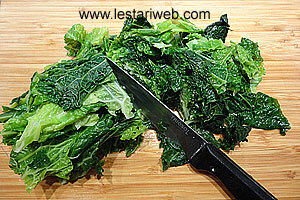 Special for savoy but not necessary for curly kale: Add 1 tbsp salt, mix and squeeze until the texture getting soften. 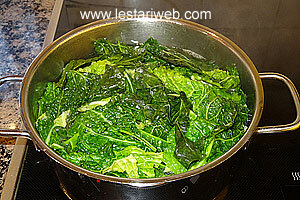 Blanch cassava/savoy/curly kale leaves until tender. Set aside to drain then roughly slice. Heat 50 ml oil in a frying pan, fry the ancovies until golden brown. Set aside to drain. 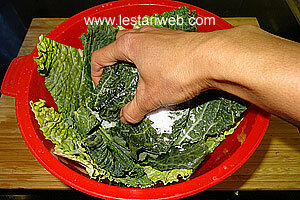 Put all ingredients for the seasoning paste in a blender or food processor & blend until smooth. (If necessery add a little bit oil to help the blending process). 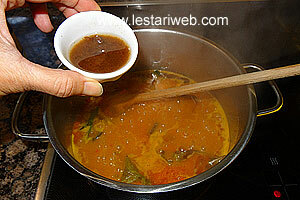 Heat 2 tbsp oil in a saucepan, stir-fry the paste with lemongrass, galingale, kaffir-lime leaves & bay leaves. Transfer the paste to a larger saucepan. Add in the water and tamarind juice. 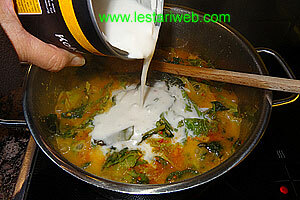 Pour-in the thick coconut milk, bring to boil then reduce the heat to simmer and stir often for 15 minutes. Adjust the seasoning, add salt & sugar to taste. Stir to mix. Garnish with fried anchovies (if any). Serve hot. If you're using blender or food processor instead of mortar or grinding stone to make a spice paste, you will probably need to add some liquid to help the blending process. Therefore there is an important method to be noted to get the optimum result.